These intelligent canines are known for their jobs as police assistants, search and rescue pups, contraband sniffers, service dogs and more. There’s no doubting the fact that German Shepherds love to work! The American Kennel Club describes their temperament as confident, courageous, and smart herding dogs. They’re fiercely loyal protectors, but don’t let their intimidating looks fool you—they’re friendly and adorable, too (keep scrolling for photographic evidence). German Shepherds are one of the most popular and recognizable dog breeds in America and for good reason. Experts say this breed is top-notch when it comes to learning and retaining training lessons for a number of special services, like bomb-sniffing and opening doors. They’re popular choices among military, police and other service personnel thanks to their high intelligence and loyalty. Their extreme loyalty doesn’t stop at the end of their workday. German Shepherds are excellent guardians and will do anything to protect the ones they love. They are gentle family pets and the perfect cuddle buddies. Running, hiking, fetch—German Shepherds love it all. These dogs are very active and need a lot of exercise and stimulation to stay happy. If you’ve ever considered doing an agility course with a dog, choose a German Shepherd. German Shepherds are so good at their job because they think of it a lot like how they think of play. And playtime is a German Shepherd’s favorite time. Medium-length and thick, the coat of a German Shepherd needs some grooming. Usually, that just means a bath and a quick brush every once in a while. In the warmer months, that could mean more brushing once every few days. Their thick, double coat means a lot of shedding. Ask your groomer about their de-shedding service! Though size varies between individuals, a standard German Shepherd weighs about 60 pounds. Whether you already own a German Shepherd pup or are looking into it, be prepared for a hefty lap dog! The German Shepherd is from Germany (who would have thought?). They were originally bred for their striking good looks and intelligence, making for a great working dog on the police force and in the military. They were so cute that dog-lovers in other countries soon caught on and began breeding them themselves. If a stranger approaches, German Shepherds will alert you. These dogs are very protective of their homes and family and make excellent guard dogs. German Shepherds don’t take well to couch potato owners. They need stimulation, even if they are a family pet and not a trained deputy. This can be in the form of playful games, puzzle toys, tricks, and obedience training. Otherwise, German Shepherds may show off some unpleasant behavior, like chewing. The first Seeing Eye Dog was named Buddy, a 1920s-era German Shepherd dog. Buddy’s success in guiding his blind owner gave way to the service dog movement. They might be curled up at your feet or lying down a distance away, but German Shepherds are always watching over you. It’s in their nature to protect their family. 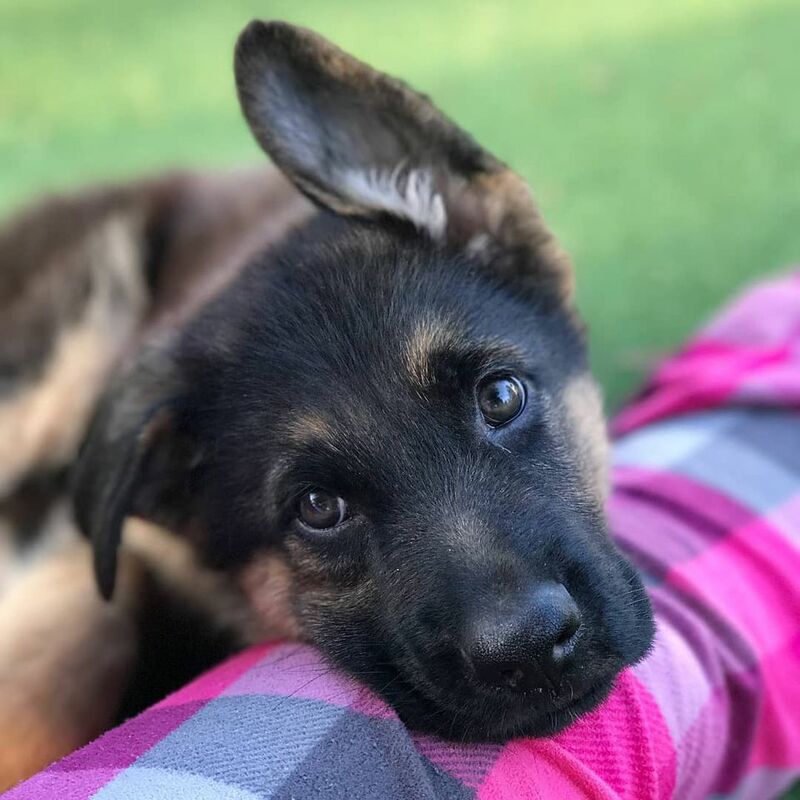 Perhaps the most notable feature in German Shepherds is their adorable pointy ears. When they’re born, a German Shepherd’s ears are usually relaxed and floppy. They perk up as they grow older, making them look extra tall and important. Some common German Shepherd colors are black, tan, or a mix of the two. Beautiful all black and all white German Shepherds are out there, too. Though they have important work to do, these dogs can be goofballs. They’re always ready for a romp in the yard or a game of fetch. Even though German Shepherds weren’t bred to swim, they are naturals in the water. This breed is inherently athletic and courageous—nothing can stop them, not even water. Before they’re pros, they might need a doggy life jacket to be safe. When it comes down to it, German Shepherds are bursting at the seams with love. Though they are protective, that doesn’t mean they’re not friendly. It may take a few seconds for you to earn their trust (let them sniff you before petting), but prepare for a goofy lifelong pal once you do.